Me and my boyfriend Roger decided to go as the Mad Hatter and me as the Queen of hearts. We try to go all out every year on Halloween being our anniversary and all. He told me I always scream at him (when I don’t! 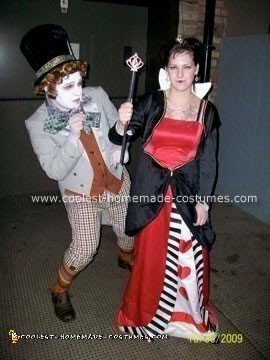 lol) and would tell me that its always “off with his head!” So we decided to pair up and go as the queen of hearts, and he just loves crazy characters, and is pretty crazy in real life so the Mad Hatter was PERFECT for him!